Home / News, Politics / Here is the big man who won the tender to supply the ugly Kenya Police uniforms to over 150,000 men and women - Kenya is a peculiar country!! Here is the big man who won the tender to supply the ugly Kenya Police uniforms to over 150,000 men and women - Kenya is a peculiar country!! Thursday September 13, 2018 - President Uhuru Kenyatta has unveiled a new police uniform today and announced the merger between the Administration Police and Regular Police. Making the announcement at the Kenya School of Government, Uhuru said the new changes will enhance visibility and reform the corrupt police service. 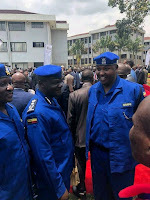 The uniforms which are blue in colour were paraded at the Kenya School of Government. The officers wearing the uniforms marched to the podium to showcase the new outfits. However, many Kenyans questioned Uhuru’s move saying he should have reformed the housing of police officers who live like rats, their salaries and working conditions. Most police officers live in some of the most deplorable shanties known to mankind and are among the poorest paid officers in the world. The new police officers’ uniform is said to have been supplied by a Chinese company. The company will supply 150,000 pieces before the end of the year. It must have been designed by men only! It is garish!